I need to calculate a specific distance in an area. 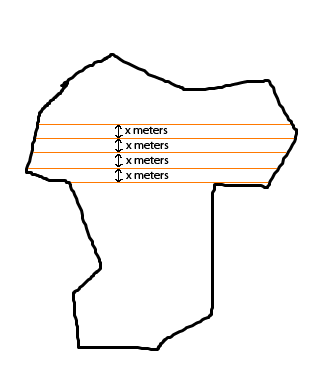 The distance is calculated from parallel lines in a polygon, And I need to find out how many parallel lines (with x meters distance to each other) can a fill in a polygon. Is there some ready function for this operation in postgis or mapscript? Or do I need to implement it myself? I want to calculate how many orange lines can I put in polygon, and total length of these lines. This was the length part of your problem mentioned in the end of the question. To count the number of lines is no problem of course. Then just use count(*) on the top row. Not the answer you're looking for? Browse other questions tagged postgis polygon mapscript line or ask your own question. Filling Polygon with Lines in ArcGIS Desktop? Creating Lines in Bounding Box at specified distance apart?